Truro City have appointed former Exeter defender Steve Tully as player/manager until the end of the season. The 34-year-old replaces former boss Steve Massey, who was sacked after nine months in the role on Wednesday. "Steve's got a big job to do: he's got to gel the team back together and come in with new tactics," Truro owner Peter Masters told BBC Radio Cornwall. "We will review it at the end of the season and hopefully if he does a good job it may be a permanent position." 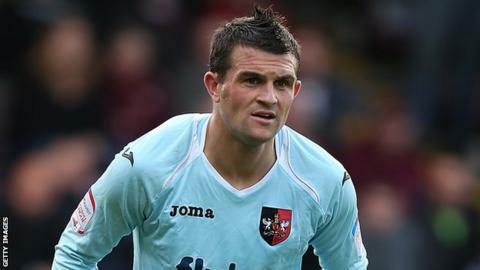 Tully made more than 250 appearances for Exeter and also played for Torquay and Weymouth, but was released by the Grecians at the end of last season and joined the White Tigers in October. Masters said Massey was dismissed because he felt the club, who are 19th in the league table, were "going in the wrong direction". Truro have won just 10 league games all season and suffered early exits from the FA Cup and FA Trophy. "Steve's (Massey) glass is always half-full while others think it's half-empty - and it's my job to make sure there is a glass. "We're looking now to plan for next season and given the set-up I just felt we were going in the wrong direction," said Masters. "There's been some disagreements with various tactics and certain things get fed back to me. Steve's a smashing guy and put in 110% and everyone at the club would acknowledge that but it's time now to make a change." He added: "Our results have always been up and down. You need consistency in this league and it's a very, very difficult league. "I'd say it's harder than the Conference South and if we're planning to get out of it we need to start planning now. "We've got some very good players and no-one can deny that, it just may be that they need to be sorted out in a different direction and with different tactics and perhaps a fresh face will help them do that."